It’s been some time since my last post, but not for lack of experiences to share! In fact, August seems to have brought us an entire summer’s worth of Kenyan culture in just a couple of weeks, and time truly has flown by. Keeping the stories brief will be a challenge (or else I may have you reading for hours), but I’ll do my best without having to sacrifice any awesome-ness. First things first: THE SUN HAS RETURNED! Can you tell I’m in my glee? Applying sunscreen twice a day is a welcome change from zipping up my sweater and hiding under the hood. Of course, with this sun comes dry, dry, DRY dirt, leading to dusty scrubs, dusty hair, dusty hands, and undoubtedly, some fairly dusty lungs after travelling all day over the roads of Naari from farm to farm. We’ve learned that the rains won’t come again until October, so we’ve been happy to visit farmers who are preparing silage to feed their cows as less forage becomes able to be harvested in this dry season. Next, on to the real excitement. If you were to ask me at the end of July how things were going, I would have had to admit my days were feeling slightly monotonous and I had begun to feel worn-out. I partially blame the poor weather, together with some happenings in Canada that left me wishing to be in Newfoundland. Thankfully, the universe pulled through with a pick-me-up the evening Boni called me to the kitchen and said, “Kendi, would you all like to attend a wedding?” Oh, would we ever! Who could pass that up!? On August 5th, we all fancied up – our team almost unrecognizable without our scrubs and boots! – and visited nearby Isiolo, where Boni’s high school friend, Andrew, was marrying his lovely bride, Lydiah. We attended the ceremony in a Catholic church and while the service was primarily in Kiswahili, much of it was familiar to weddings at home – you know, reading Bible verses, speaking vows, singing hymns, taking Communion. The differences, however, were why we were there: The bridal party and groomsmen danced up the aisle! Children from the church congregation danced up the aisle! After the vows and the kiss, the bride and groom danced down the aisle! Everyone sang and shuffled in the congregation, while we four wazungu (“white people”) tried to keep the beat and absorb all that was happening. We completed the afternoon with a meal of nyama choma (“roasted meat”, Kenyan barbequed mbuzi, “goat”) and then pieces of wedding cake. Picture 2: Visiting with Mama Josephat at Unity, a women’s village in Samburu (left to right: Ashley, Alexandra (VWB), Hannah, Mama Josephat, Aiyanna (VWB), Madi, Salome). The next morning, joined by our friend Salome and two girls interning with Veterinarians Without Borders (VWB), we all piled back into a car to drive a bit farther north to Archer’s Post in Samburu County. Our mission for the day: visiting a women’s village called “Unity”. I was very fortunate to have been told about this village by a classmate, Rachael (doing equally awesome vet work this summer in Vietnam! ), and was incredibly excited for an opportunity to learn about women-governing-women in the middle of such a patriarchal society. At the gate, we were delighted to be welcomed by song, dance, and giant, beautiful, beaded necklaces! I was in my glee! (The theme of today’s blog, apparently!) Following some group dancing and photos, we were welcomed by Mama Josephat* and given a history of Unity village – established in 2011 by half a dozen women, the village was built for those wishing to escape such challenges as oppression and domestic violence at home. Today, twenty-five women inhabit Unity, each with shared duties and responsibilities, all taking part in meetings several times a month, all with opinions and voices that can be expressed and heard. In addition to learning about Unity, I took a moment to speak with a member of the village, Patricia, about the anti-FGM (female genital mutilation) movement. I was intrigued to learn about such a powerful push against such a deep-set and long-practiced tradition remaining in some parts of Kenya. Patricia explained to me that women in Unity do not practice FGM, and their daughters (like all girls in Kenya that are attending school) are taught that no one can force the practice upon them. I asked what has encouraged modern Kenyan women to move away from the practice, and was told that aside from health and well-being, women are becoming aware of the unfair standard set against them – in a culture where men can take multiple wives, women were traditionally “circumcised” as girls in order to be fit for marriage and as a means of preventing infidelity. Patricia explained that the practice “takes a woman’s feelings”, and that women are becoming more aware of the injustice being done to them. In Kenya, female genital mutilation has been outlawed, but as with any major paradigm shift, the change and acceptance of something “new” takes both time and an increase in education. I left the village happy to have had the opportunity to learn about these forms of women empowerment in Kenya, and all of the change, potential, and growth that is coming in this beautiful country. Picture 3: Women in costume performing a traditional cultural “folkdance” at a Methodist Church women’s rally. Only days after a fantastic weekend, we chanced upon learning of a Methodist Church women’s rally happening at a nearby school. In our scrubs and boots, we visited in the morning to catch some of the singing, and to happily be greeted by Beatrice (mom) and Jane (Gatwiri). More glee! The ladies invited us back for the afternoon so that we could take in the real fun – traditional dance! We squeezed in one more farm for the day then returned to costumes, color, song, and the most vibrant energy ever! And while I sat on the grass with Beatrice by my side, I had another feeling of “wow, I am actually in Africa”. Honestly, how I’ve gotten through this entire summer with only tearing-up once from the emotion of it all is truly a miracle. Picture 4: Making fond memories with Magda and mandazi – two of my favorites from Kenya! The cultural immersion continued even at our Kenyan home, when George taught me the recipe for mandazi, yummy thin pieces of bread fried in oil (that to my delight are very similar to fry-jacks, my favorite breakfast treat from last summer in Belize! ), as well as how to make masala tea (“spiced tea”, what we are more familiar with as chai) – tastes of Kenya to compliment the music, the dancing, and the colors. Picture 5. Delivering a seminar to all members of Naari Dairy, and to reach out especially to members who, due to time constraints, did not receive a visit from our team this summer. And with that, we’ve reached our final day in Naari. Lee, Remmy, and I delivered a brief presentation to farmers of Naari Dairy to highlight the most common challenges and issues we encountered with them over the course of our internship – primarily issues of underfeeding dairy meal and minerals and how to accurately measure the weight of cattle to determine appropriate doses of deworming medicine. Inspired by calendars printed with nutritional messages (in Kimeru) that were distributed by the nutrition team and recognizing the limitations of our English handbooks, Lee drafted up a brief handout summarizing all of our advice that was then translated and given to attendees of the seminar. It was our wish that having the written information will help with their memory as well as the implementation of new practices, and will encourage farmers to share the knowledge with their neighbours. The seminar ended with a grand surprise when members of the Dairy presented us with thank-you gifts: “Naari Dairy” shirts, plus lesos (colorful fabric worn tied around the waist, often printed with a border and a proverb) for the girls! IN MY GLEE. Later that evening, many of our new friends joined us for one last dinner and bittersweet “goodbyes”. The surprises continued as Mama Melissa* walked in carrying a black forest cake (my absolute fave! IN MY… well, I don’t really need to say it again, do I? ), the decoration of “Farewell Friends” reminding us of how blessed and honored we’ve been to have found ourselves a family from across the globe. Picture 6. Being wrapped in a leso – what a beautiful farewell present! For one last time from Kenya, I send my love and hugs. *Kenyan mother’s are commonly referred to by the name of their eldest child. For example, “Mama Josephat” is named for her eldest son, Josephat, and we sometimes call our friend, Caroline, “Mama Melissa”. Hello everyone, Hannah checking in again. We’ve had a busy few weeks here! It is always difficult to get back into the groove after vacation. The first week of July we visited Mombasa, which is a city located on the coast. This was my first time swimming in the Indian Ocean. Mombasa was beautiful and warm, which was a nice change from the Naari region which is quite cold right now. The months of June and July is the cold season here in Kenya, which means grey skies, foggy and an average temperature of 15 degrees Celsius. Thankfully, we are just now coming out of our cold season and back to enjoying sunny and warm Naari! The group hanging out on the beach in Mombasa: we decided that we needed a goofy photo! It was beautiful and sunny on this day. Luckily we all managed to escape with only minor sunburns. The Kenyans keep joking that we are working on our African skin. It was also a bit of a sad farewell, as Madison and I parted with Sarah Muthee, a recent graduate from UPEI Master of Science program. Sarah has become our big sister, our Kenyan protector and, most importantly, our good friend. The first few days without her were definitely a little quiet. Luckily, we know that Sarah is always just a call away (we call her regularly for advice- ha ha!). We also had our last school parent seminar on Tuesday, at Ndunyu Primary School. The nutrition team has visited nine local twinned schools to perform a nutrient analysis on the uji and githeri being served to students. This is done by taking weights of the ingredients as well as weighing the portions given to the students. The information is then put into an excel spreadsheet which calculates the macro and key micro nutrients in the meals. A week later we return to the school and give a report to the head teacher filled with our recommendations on how they could improve their meals. At this time, we also put on a seminar for the parents where we provide them some simple tips to make staple foods healthier as well as provide a small sample of our super githeri! You may have read about this in past blogs from the nutrition team: super githeri is simply githeri made with all of our recommendations. Our recommendations include using whole grain maize, having a 1:1 ratio of maize to beans, soaking the dried maize and beans, and incorporating one green and one orange vegetable. These changes are very simple and practical things that Kenyans can do to drastically improve their diet. Madison giving me a quick piggyback. You could say that we were excited to be handing in our last school report. For this seminar, the teacher had told us to expect 20 to 30 parents, so we were thrilled when we walked in and there were 70 parents! This was also the first time that these parents had heard these messages. The parents asked so many great questions about iron deficiency, proper soaking techniques for maize and beans and more. It was a dietetic interns dream come true to get to share so much nutrition knowledge. Madison up sharing some of the nutrition messages with Salome (a Farmers Helping Famers employee) translating. Without Salome, these seminars would not have gone as successfully as they did. This past weekend, I had the honour our receiving my Kimeru name. Here in Meru County, people are given a Kimeru name (Kimeru is the local dialect) either based on their personality traits or they inherit their grandparent’s name on their father’s side. Steven Mwenda from Farmers Helping Farmers and Remmy, a Kenyan vet supporting the vet student team, are two wonderful friends of the team: they decided that I should be called Makena, which means that one that is joyous or always happy. The locals always have a good laugh when we introduce ourselves using our Kimeru names. Hannah (Makena) is always happiest with a good cup of coffee in hand. A couple weeks ago, the vet team decided to switch things up and join the nutrition team in the field at the Nkando school which is located a fair ways away from where we are located in Naari. We all piled into the back of the Gypsy and headed to the much drier Nkando area. We watched (and helped a bit) the nutrition team do their school assessment and checked out the greenhouse at the school which was very well maintained. This greenhouse is very important for the school since they were basically only feeding maize in their githeri due to how dry the area is, but now they are feeding a much more balanced githeri with beans, greens and orange vegetables included. While at the school, we also got to play various games with all the students. We also learned that snakes live in the area, but thankfully we avoided any encounters as Hannah and I are terrified of snakes. On the vet side of things, we have been visiting lots and lots of farms still. We had one case that stood out however. We were visiting a farm that had a cow that wasn’t coming into heat but was being fed well. Upon a rectal exam, we noticed the cow had a softball-sized cystic ovary. This was way bigger than normal as a normal ovary is closer to a grape in size. In order to solve this problem, we administered a GnRH hormone to induce ovulation and recommended some follow up injections. To celebrate Canada Day here in Kenya, we decided to go hiking up one of the monster-sized hills in the area. Once at the top of the hill, we took a few shots with the Canada flag and enjoyed the view before heading home. This hill is unique in that we saw a few other people at the top of the hill since it is a common place for people to go to and pray. In addition, we also saw a few cows that people will walk up the hill to graze. I hope you all had a great Canada Day. After working hard for the first month and half, we were in Mombasa in Eastern Kenya for a few days to have a little relaxing break. This is Hannah from the 2018 Nutrition team. Every day that I spend here I am fortunate enough to learn something new and one day last week was no exception! On Monday, the nutrition team had the opportunity to spend the day with the veterinary students visiting local farms. I walked into this experience knowing almost nothing about dairy cows and actually managed to walk away with a fair bit of knowledge! Growing up in rural New Brunswick, I was often around farms but never actually had the opportunity to visit one so this was a very exciting opportunity for me. The first farm that we visited had an eager farmer named Gatwiri, who spoke very good English. She was excited to hear that we were students as she herself had taken agriculture at a local college so she wanted us to get the most out of the visit as possible. She was the very proud owner of three cows and a calf and said that she had hired people at one point to take of them, but wanted to make sure that they were getting the best care possible so she took over the job herself. Lee, Ashley and Remmie (a veterinarian who is works for Farmers Helping Farmers) discussed nutrition, cleanliness, reproduction and the comfort of the cows with Gatwiri. The vets soon learned that two of her cows had not shown signs of heat in several months and it was determined to be because the cows were too thin. Remmie and Ashley performed a rectal exam to determine if the cow was going to be ovulating soon or not. It turned into a very exciting moment as Ashley actually found her ovary during a rectal exam! I think I can speak for all of us that we were extremely proud of her. I was just happy to be there to snap a picture of the moment. Ashley performing a rectal exam on the cow to see if she was going to be ovulating soon. This was the first time that Ashley was successful find an ovary. After the rectal exam was complete, the vets wanted to check the cows for mastitis, which is done by collecting a small sample of milk from each teat on the cow and then adding a solution which will cause the milk to gel if positive. Lee offered to let both Madison and I collect a sample from a teat. As it was my first time milking a cow, I needed a little bit more direction than some of the others; however, after a few attempts I was successful! As we were wrapping up the visit, we all wanted a photo with Gatwiri. Although we went to other farms that day, this farm- and this farmer- in particular stood out to me not only because she was so kind, but also because she was so genuinely interested in not only her own learning, but also ours. One last photo with Gatwiri before we left to go to the next farm. Missing Madison who graciously took the photo. This opportunity spent visiting farms was a wonderful example of the many inter-professional/ learning opportunities that have presented themselves to us during our internship here. One thing that I have realised is that no intervention is completely separate from another. So when the vets go visit a farm to talk about ways to get the most milk from the dairy cows, it means that they can sell more milk to the dairy and that they and their children can drink it more milk! When a farmer is able to sell more milk to the dairy, it means that she/he has additional income. If they have additional income, it means that they can buy more food, which is where the nutrition team comes: we provide education on which foods are nutritious (or not) and how to prepare healthier meals from the food they grow and buy. I have really come to realize that even when our interventions seem very disconnected, that they are actually integrated and, together, can make a difference for rural Kenyan farm families. Illness has struck the intern home last week, as Ashley came down with a bad cold and was bed ridden for a day. The next to catch the cold was Hannah, who spent many days coughing and sniffling at home interviews and school assessments/seminars. I personally thought I had dodged this bullet, as many days passed after the two girls fell ill, and I still felt fine. I was wrong! After our long drive to and from Nkando primary school for the assessment, I developed all of the classical symptoms of a cold. I believe the dusty dirt roads were a catalyst to my chest congestion that quickly formed that evening. I required one and one-half days of bed rest, leaving Hannah and Sarah to conduct a school seminar without me, before I regained my strength. Ashley, Hannah and I are all now on the mend, each of us only sniffling and coughing a few times a day. We were hopeful that the worst was over, and that this Kenyan bug had left the household for good. That is—until Sarah lost her voice! As I sit here now writing this blog post, Sarah sits next to me sipping “dawa” (ginger, garlic and lemon tea) unable to speak due to the congestion in her throat, Ashley and Hannah leave the room periodically to cough and sniffle while they sit, and Lee sits working on his laptop, perfectly healthy. We are all waiting for this cold to take its next victim; will it be Lee or Remmie? Despite the irritating cold symptoms, we are all in good spirits and enjoying Kenya and all of its experiences. On Sunday, we took a trip to the Lewa conservancy with Salome, an employee of Farmers Helping Farmers and hiked to an amazing waterfall. Half of the group nearly ‘hacked up a lung’ from all of the hill climbing, but we all had an amazing time and got to hear an elephant far off in the distance trumpet; an experience Ashley and I crossed off of our bucket list! This Kenyan cold cannot keep these Canadians down! Monday, June 18 marked four weeks since arriving in Naari, and a whole month of being in Kenya. Dr VanLeeuwen has returned to Canada and as of today, Lee and I have visited 45 smallholder dairy farms. Thinking about already being a third of the way through this internship has me thinking about things we are witnessing, about what’s been difficult so far in living here, about what’s been so easy, and about the mark this country is leaving on me. Congratulations, it’s a girl! This heifer was born the evening before the day of our visit. Female calves are celebrated because they will grow to be milk-producing dairy cows! Here in Naari, wakulima (farmers) – especially those with only one or two ng’ombe (cows) – depend on their cows’ health and productivity in order to sustain themselves, their families, and their homes. Producing more of high quality maziwa (milk) means making a better food and earning a greater pay, and more income means enough funds to buy more food, send children to school, and afford medicines. When the farms do well, the homesteads grow. Class attendance grows. The entire community grows. By partnering with Naari Dairy to do research, these projects from UPEI and Farmers Helping Farmers are helping to set a knowledge foundation that farmers need to reach these goals of healthier animals and greater yields. So, we are “catching hands” – taking science and information readily available to us and making it accessible to the farmers. Relaying the information is only part of the whole job, though. The hardest part is left to the farmers themselves: walking. They must be willing to use the new information and skills, make changes, and sustain them. The 45 farms we’ve visited have included those which have received cow nutrition training, or reproduction management information, or both. Some have been instructed on stall design and cow comfort, and others still served as “research controls” which received no educational visits from the teams over the past three years. In each of these groups, Lee and I have witnessed good examples of management and husbandry as well as poor ones. What I’ve come to realize is that the background of the farmer – for example, her education level, her family history of farming practice – together with her willingness to work and change in order to improve, has the most influence over the condition of her animals, the success of her farm, and the success of our visits. Last week, we met Jane. Her farm was included in our “never visited” group and stands out to me for a few reasons. First, it was the first farm Hannah and Madi had chance to visit with us. To everyone’s delight, they did a great job with collecting milk samples for our CMT! Second, Jane had studied agriculture so was already full of her own knowledge on rearing animals. Visits like this are my favorite – Lee and I have more opportunity to interact and to speak in English, and the farmer engages us with many questions and obvious interest in what we are teaching. Her farming practices required some minor adjustments, but she was easily able to understand where changes were needed and exactly how they would help her cows feel and be “better”. Finally, it was on her cow that I felt my first “real” ovary! (I’m ignoring the cystic ovary I palpated first with Dr V – being so large, that one feels like it is cheating a little!) and everyone, Jane included, shared in my mini-celebration. Now, let’s change the pace a little. After all, we aren’t only working! “What about living ‘Kenyan life’?” you ask? Well, I told you last time that my adjustment felt instant and effortless, but I’d be lying to you all by saying there haven’t been some small challenges. For starters, I’m still less than thrilled about the cold, and though I’m less vocal with the complaint these days, my “poor, cold Canadian” label has stuck. Sarah has even let me borrow a warm wool hat. Who knew I’d be needing that in June? New foods and a new environment have brought with them new tests for my immune system – with a 24-hour battle with stomach upset and one head cold now on the mend (dancing with kids at the fair was asking for it…), here’s hoping I’m toughened up for the rest of the summer. Lastly, the language barrier creates for me a very personal challenge every day. Not being able to lead with questions and discussion on farms where no English is spoken leaves me restless, and I’m frustrated when I’m limited to greeting and playing with small kids, or the slow process of saying things in English, having it translated to Kimeru, have the farmer respond in Kimeru, and then have that translated back into English. They said my patience would improve while in Kenya – they were right, by necessity. So how am I coping? I sit by the fire, tuck my toes into Jennifer’s hot pepper slippers, and drink hot dawa (“medicine”, a tea of ginger, lemon, garlic, and honey) from the biggest mug I can find. On farms, I distract myself from dialogue I cannot understand by looking around the farm, taking photos of flowers, and finding baby animals to play with. As for the kids, I do my best with smiles, waves, and “mambo!” (like, “what’s up?”). “Mama Patience” gifted us with miwa and asked to take a photo of us and her eldest child, Patience, our new “little sister”. Thankfully, I have more that’s been easy than what’s been a little hard. The selection committees for our internships couldn’t have known what a great job they were doing in choosing this year’s teams, but – no exaggeration – we are all getting along so well! Life at home is incredibly comfortable. Six of us spend each evening congregated in the living room chatting over chakula (a meal), sharing stories from the day, and huddling together watching a bit of Harry Potter from Hannah’s computer screen before bed. In Naari, I am growing my Kenyan family by the day. The chairman honored me last week by telling visitors at a meeting, “Look at my daughter here. She will return to Canada, do well and graduate, then we hope she will return to Naari and we will build a house for her”. Ladies at the dairy greet me every morning with hugs and every evening with “Ashley, tell us good news and what you’ve learned today!” I’ve “christened” a cow with her name and an ear tag, I’ve gained a little Kenyan sister, and Remmie and our driver, Ndereba, say that with every new word I learn, I am becoming more of a “Meru-ian”. Sending love and hugs to Canada! Hello everyone. We had quite the eventful last week. It’s my turn to provide the summary. The week started with a relaxing weekend visiting the Ol Pejeta conservation park where we had the opportunity to see many different types of animals. We stayed in tented rooms that were within 50 meters of the area where the animals could freely roam which led to us having an amazing view of a rhino nursing its young in front of us one evening. We went on a safari drive and saw many different animals such as lions, elephants and giraffes all in their natural habitats. Unfortunately, we just missed out on seeing a cheetah. After doing some of our herd health management advice visits on farms on Monday, we travelled to the nearby Buuri dairy on Tuesday and met with a few members of the board. The vet and nutrition teams will be working more with the Buuri group in the future, along with a program evaluation team. As part of our trip to Buuri, we collected blood samples from the coccygeal vein (tail vein) or the jugular vein from a representative group of cattle in different zones. 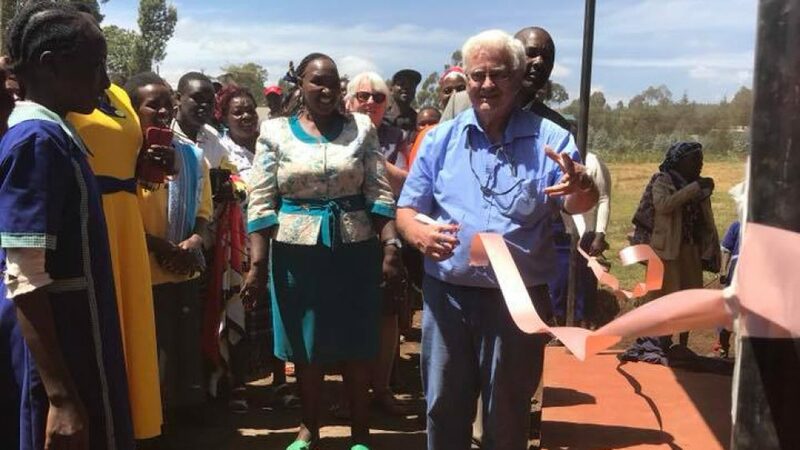 The blood samples will then be analyzed in Nairobi for presence of Bovine Viral Diarrhea virus (BVDV) and antibody, a common virus in Canada that can lead to abortions, pneumonia, diarrhea and other problems. This was a great experience for Ashley and me, as I have only done a few blood collections on cows, and it was the first time for Ashley. On Wednesday, we travelled to several farms in the Naari region to administer a vaccine for BVDV, Bovine Respiratory Syncitial virus (BRSV), Parainfluenza-3 (PI3) and Infectious Bovine Rhinotracheitis (IBR). This injection is given subcutaneously (under the skin), by tenting the skin and inserting the needle in the raised area. In the afternoon, we had a meeting with some board members of the Naari dairy as Dr. John was leaving the next day. The next day, we said our goodbyes to Dr.John as he was leaving to begin his travels home, which left Ashley, Dr.Remmy and I to fend for ourselves. On our very first farm, we encountered a cow with milk fever. Milk fever occurs right after parturition when the need for calcium increases and the cow is unable to match this increase. This leads to the cow lying flat out and unable to stand. Right before we arrived, a vet tech had already treated the animal by giving the animal an IV injection of calcium and a subcutaneous calcium injection to increase the calcium levels. The IV injection will lead to a quick increase in blood calcium levels, while the subcutaneous injection will be slowly absorbed. Since there wasn’t much we could do at that time, we carried on with our herd health management advice visits on farms that did not have a personal farm visit through our project yet. We came back to the milk fever farm in the afternoon to check on the cow and get it up so that she wouldn’t get muscle damage from lying down too long. On Friday, Ashley and I had the opportunity to accompany the Naari dairy vet tech Benard on several clinical cases. We saw a case of East Coast Fever and a case of Anaplasmosis. Two diseases transmitted by ticks that are commonly seen in Kenya but not in Canada. Benard also bred a few cows by AI and dehorned a cow using a dehorning wire. This was the first opportunity for Ashley and I to witness dehorning using this method. We also visited a farm that had over 50 cows and was milking around 30 of them. The farm used milking equipment for milking the cows (not by hand like most places here), and had tractors for the field work. For Kenyan standards, this was a large farm as most farms we visit only contain a handful of cows.